In midst of India relocation excitement, it’s very natural to think about the future: new job, new city, new house etc as well as reminisce about Seattle and our life here and ponder over what we will miss. We have heard that moves are heard on kids and we are determined to make it as seamless as possible for him. We spend as much time as we can with him and are outsourcing everything that we can afford to.If we were not moving, we would have a little celebration for his 18 month milestone. But with everything going on, we didn’t plan one – but it so happened, we spent the day with some of our dearest friends. However, I did make a couple of homemade ‘mini birthday gifts’ for him. Chocolate bottom cupcakes , a blue table and a cardboard play kitchen. 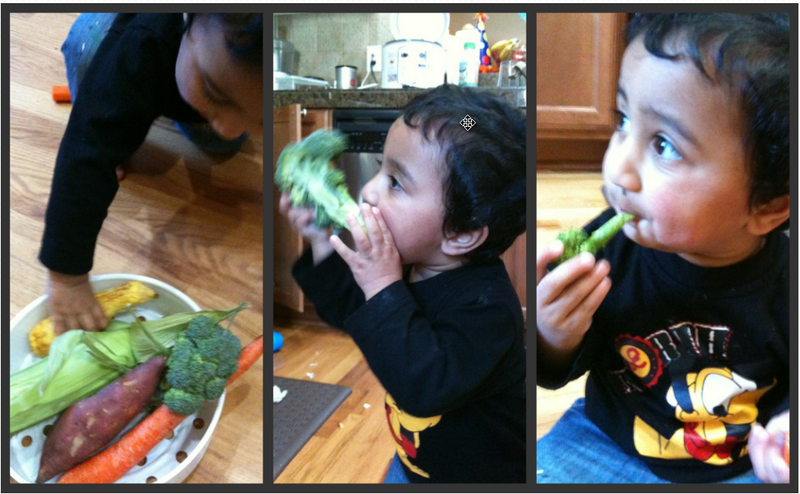 He seems to be enjoying making ‘pretend’ food in his kitchen. 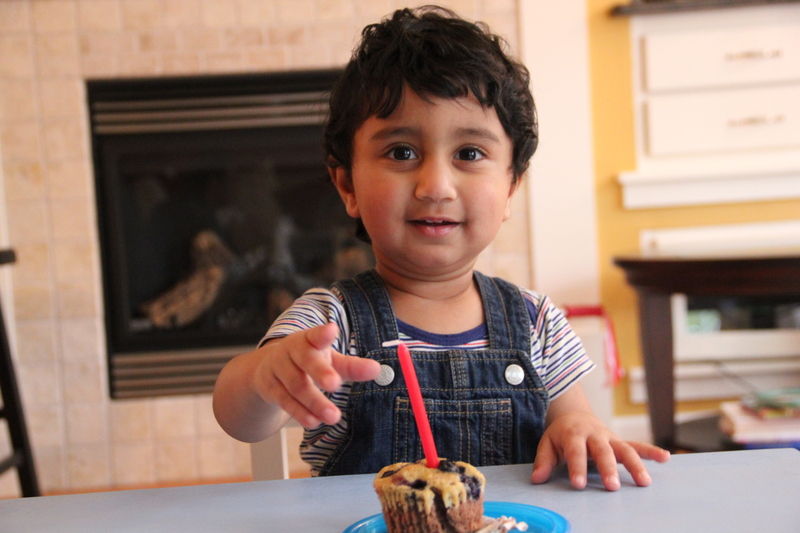 And when he bit into the cupcake, he said ‘Nice’. 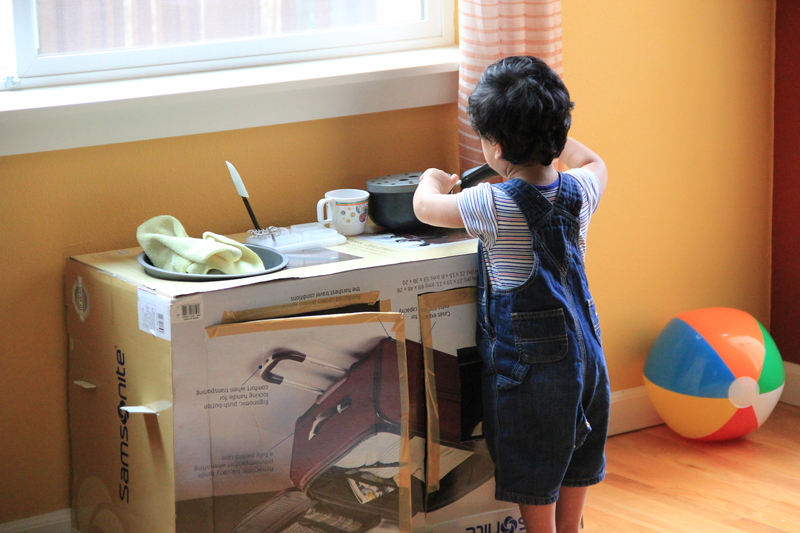 But, mostly he plays with his new cardboard kitchen. 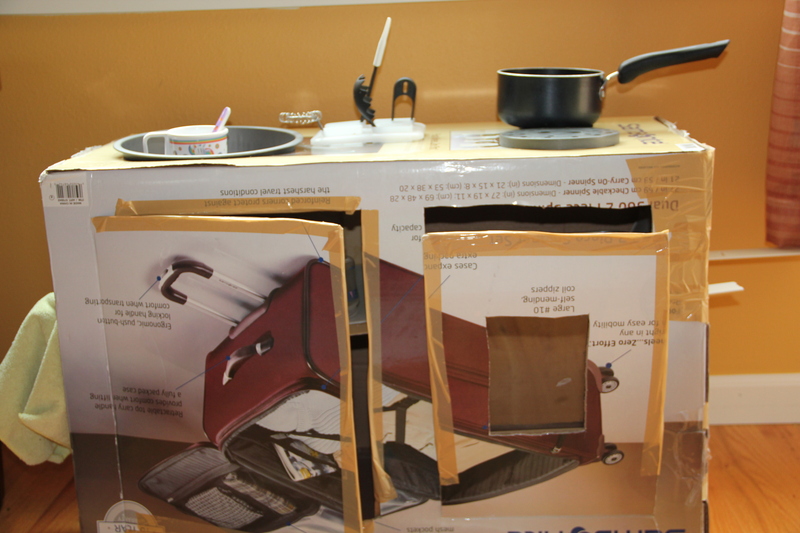 Removing little plastic containers of food, putting things back into the cupboard, opening and closing the ‘oven door’ and sauteing in the sauce pan above keeps him tinkering around for a while. 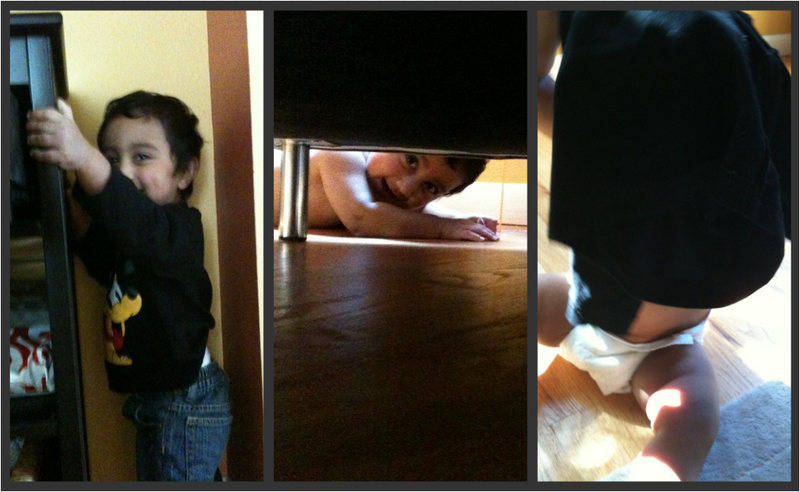 Anything that keeps him busy, makes me happy! 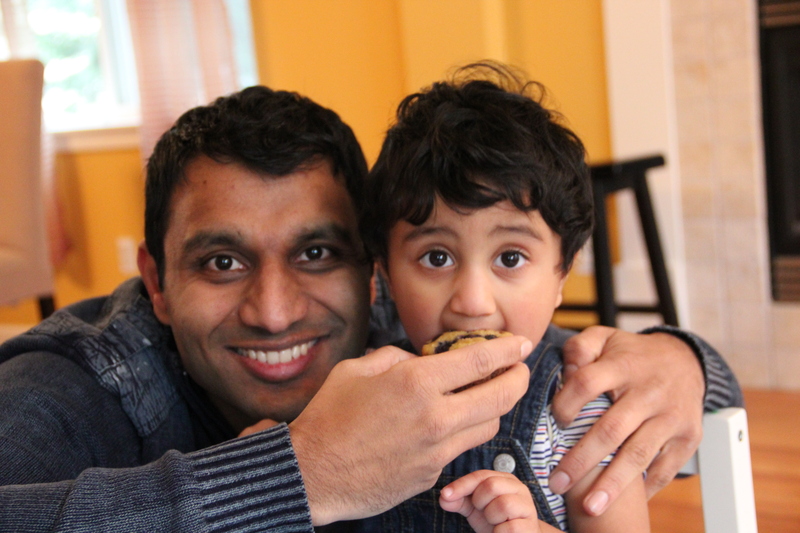 Around the time Varun turned one,I began thinking about how quickly the year went by. I mean, when he was born and we were going through sleepless nights, struggling with breastfeeding and in general adapting to this new life, his one year birthday was a milestone I could not wait for. It was my belief then that things would change for the better by one year mark. To be honest, some things are better ( no more pumping at work or making formula) but other’s are more or less the same (such as sleep) or even worse (mobility, feeding time mess etc).And to add to this, there is always work. Sure, I can think about scaling back or maybe doing something less stressful but I really am enjoying what I am doing ( finally I am working on some meaty stuff) and I will really regret giving that up. At about the same time, a couple of my friends posted on their Facebook page, articles and quotes about ‘Loving your life’ and ‘Changing things that don’t work’. While these are idealistic goals to achieve, they cannot be achieved overnight. Heck, even sleep training using Cry It Out method takes atleast 3 – 7 days to achieve. I was discussing these amongst other things with Vipul and his simple answer was: ‘Change your attitude’. If I complain about every sleep less night, how long it takes to get Varun to sleep, fret about his multiple night wakings, or stress over every deadline and get upset over what someone says at work – I will never be happy. Rather we will never be happy. And no matter what anyone says, no one loves their jobs/lives/looks/skills etc 100% of time.The grass is always greener on the other side and simply switching lanes at every ‘slowdown’ doesnt really take you to your destination quicker- It just adds to the angst. Now changing attitude is not trivial. I can’t just read a book or take a class and boom its done.It has to inculcated and come from within. And most importantly you have to take make the time to do things that make you happy. 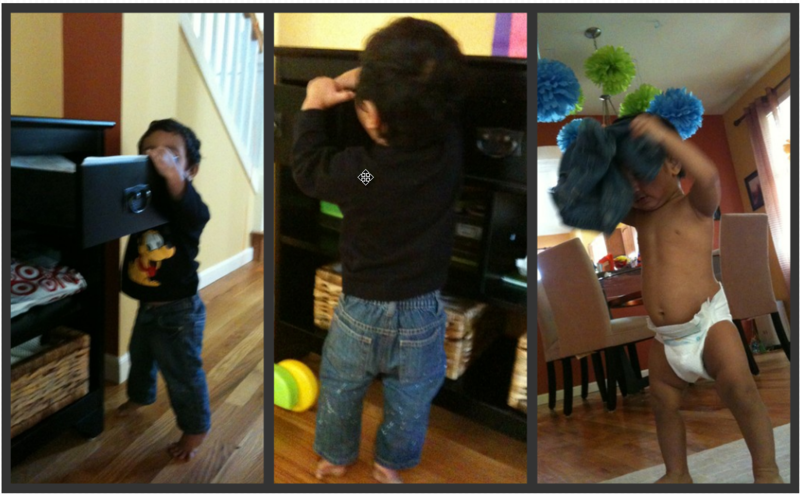 These days, nothing makes me more happy than spending time with Varun. My goal for Varun’s second year is to do something fun and special with him every week ( every day would be too ambitious and will definitely fail!). Then, even if he takes time to sleep or wake up several times at night or make a mess, atleast I will enjoy the ride. Without further ado, this is what Varun and I did yesterday afternoon once he began to feel a bit better (he has yet another ear infection and is back on antibiotics). Took stuff out of drawers and even took clothes off! 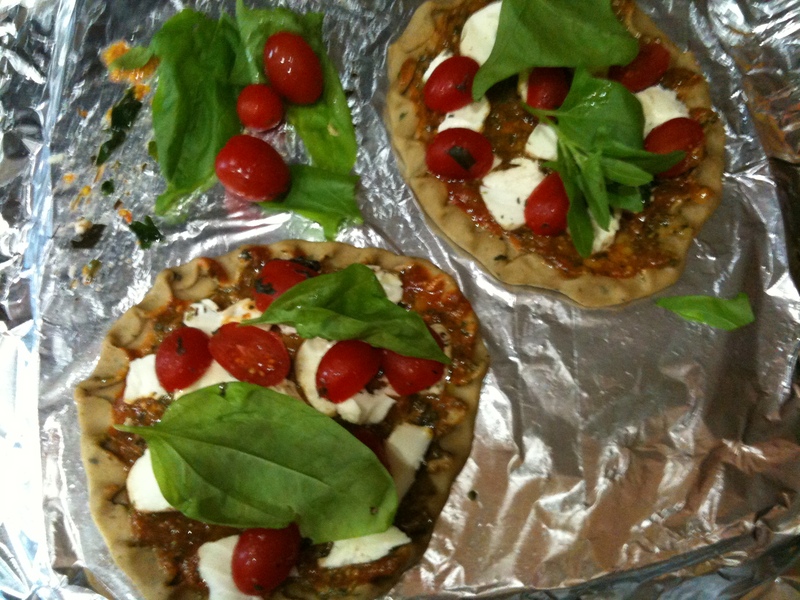 Lastly, made a pesto margherita pizzette for Daddy! 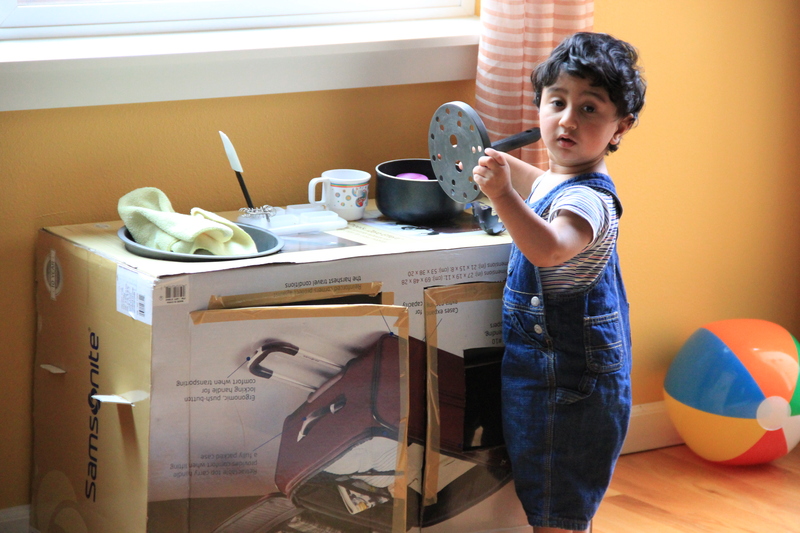 Well, he just helped me knead the dough and we had flour all over the floor but it was fun afternoon spent together.